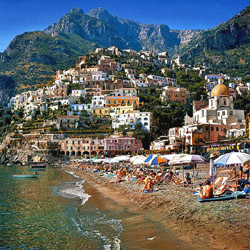 A great tour combining the most popular place of the Bay of Naples: Pompeii, Positano, Capri. You will meet our local English-speaking guide at the prearranged meeting point. 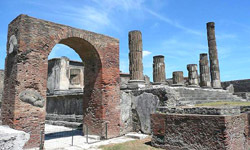 Then You go to Pompeii ruins, one of the most important archaeological sites in Italy. Two hour visit will be spent there for exploring what has been preserved by the ashes of Vesuvius for two thousand years. After that, we can transfer to the terrace of the Virgin Mary of Positano where You can take some photos of the the pearl of the Amalfi Coast. Because of its outstanding panoramic position and mild climate, together with its picturesque architecture and the lush surrounding countryside, Positano has become one of the most popular resorts on the Amalfi Coast. Then we transfer to the port of Sorrento for taking a jetfoil to Capri: 200 minutes of journey and when You land to the port, You can take the cable car for reaching Capri town. Your guide will lead You on foot to the Gardens of Augustus and then You have free time to enjoy the magic atmosphere of the Blue island . Its breathtaking caves, luxuriant vegetation and the charming narrow lanes of its small towns have attracted visitors for centuries. 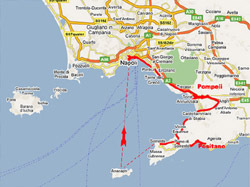 THE PRICE OF THIS TOUR OF POMPEII-POSITANO-CAPRI IS OF EUROS 250. ENTRANCE FEES ARE NOT INCLUDED.